Fact #1: availability of cloud services as a perceived option to traditional IT services has moved to prominence in the business-IT discussion. Fact #2: as IT is getting better and better at what they do, IT’s contribution to business value is being increasingly questioned. Unfortunately, if IT’s unique and critical cloud contribution remains misunderstood, IT’s “service” role will become irreparably marginalized …to the detriment of available budget and executive buy-in required to achieve any semblance of IT Operational Excellence. Yet, how many IT organizations have the wherewithal to effectively position and package their existing IT operations, let alone the essential value of their potential cloud services contribution? We need to be recognized for the value of all services we provide – both traditional and cloud …and push the discussion beyond achieving excellence to promoting the achievement. 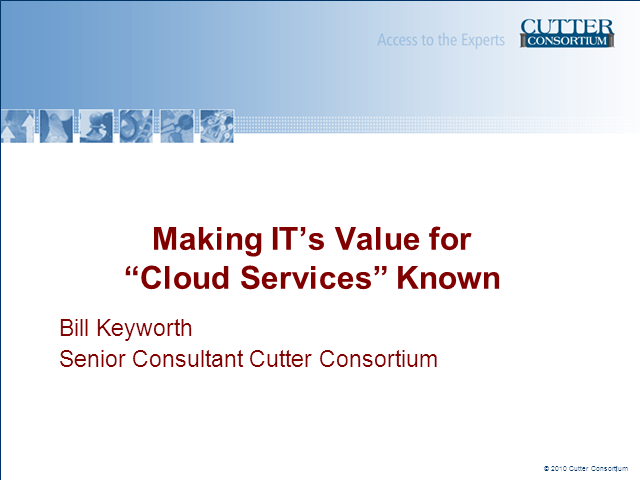 In this session, Bill Keyworth identifies how the IT Operations core value proposition (…including cloud services) must be a part of the IT Service Portfolio and packaged within the Service Catalog. Learn how to capture your IT vision, target “IT markets” and then position, package and execute what uniquely differentiates your IT service organization from external service providers. As Senior Consultant for Cutter Consortium with focus on IT Operational Excellence and as Founding Editor for BSMreview.com, a thought leadership website for ITSM’s role in successful business initiatives, Bill has established a reputation as one of the more credible and consistent voices in maximizing business value from IT operations.